SUBHEAD:Why land is still referred to as “real property,” as though others are somehow unreal. Image above: Peter Bruegel the Elder painting of "The Peasant Wedding, 1566-69. 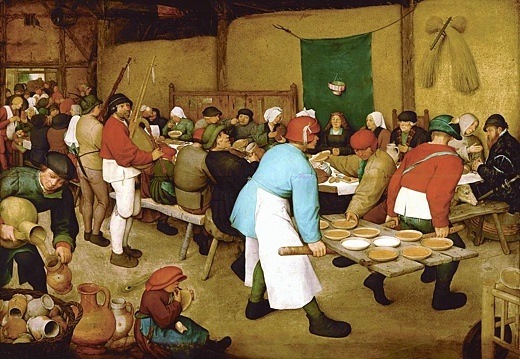 From (http://upload.wikimedia.org/wikipedia/commons/7/70/Pieter_Bruegel_the_Elder_-_Peasant_Wedding_-_Google_Art_Project_2.jpg). One of the factors that makes it difficult to think through the economic consequences of the end of the industrial age is that we’ve all grown up in a world where every form of economic activity has been channeled through certain familiar forms for so long that very few people remember that things could be any other way. Another of the factors that make the same effort of thinking difficult is that the conventional economic thought of our time has invested immense effort and oceans of verbiage into obscuring the fact that things could be any other way. Those are formidable obstacles. We’re going to have to confront them, though, because one of the core features of the decline and fall of civilizations is that most of the habits of everyday life that are standard practice when civilizations are at zenith get chucked promptly into the recycle bin as decline picks up speed. That’s true across the whole spectrum of cultural phenomena, and it’s especially true of economics, for a reason discussed in last week’s post: the economic institutions and habits of a civilization in full flower are too complex for the same civilization to support once it’s gone to seed. Back when the United States was still contending with the Soviet Union for global hegemony, that almost always got rephrased as “the free market;” the adjective still gets some use among ideologues, but by and large it’s dropped out of use elsewhere. This is a good thing, at least from the perspective of honest speaking, because the “free” market is of course nothing of the kind. It’s unfree in at least two crucial senses: first, in that it’s compulsory; second, in that it’s expensive. “The law in its majestic equality,” Anatole France once noted drolly, “forbids rich and poor alike to urinate in public, sleep under bridges, or beg for bread.” In much the same sense, no one is actually forced to participate in the market economy in the modern industrial world. Those who want to abstain are perfectly free to go looking for some other way to keep themselves fed, clothed, housed, and supplied with the other necessities of life, and the fact that every option outside of the market has been hedged around with impenetrable legal prohibitions if it hasn’t simply been annihilated by legal fiat or brute force is just one of those minor details that make life so interesting. Historically speaking, there are a vast number of ways to handle exchanges of goods and services between people. In modern industrial societies, on the other hand, outside of the occasional vestige of an older tradition here and there, there’s only one. Exchanging some form of labor for money, on whatever terms an employer chooses to offer, and then exchanging money for goods and services, on whatever terms the seller chooses to offer, is the only game in town. There’s nothing free about either exchange, other than the aforesaid freedom to starve in the gutter. The further up you go in the social hierarchy, to be sure, the less burdensome the conditions on the exchanges generally turn out to be—here as elsewhere, privilege has its advantages—but unless you happen to have inherited wealth or can find some other way to parasitize the market economy without having to sell your own labor, you’re going to participate if you like to eat. Your participation in the market, furthermore, doesn’t come cheap. Every exchange you make, whether it’s selling your labor or buying goods and services with the proceeds, takes place within a system that has been subjected to the process of intermediation discussed in last week’s post. Thus, in most cases, you can’t simply sell your labor directly to individuals who want to buy it or its products; instead, you are expected to sell your labor to an employer, who then sells it or its product to others, gives you part of the proceeds, and pockets the rest. Plenty of other people are lined up for their share of the value of your labor: bankers, landlords, government officials, and the list goes on. When you go to exchange money for goods and services, the same principle applies; how much of the value of your labor you get to keep for your own purposes varies from case to case, but it’s always less than the whole sum, and sometimes a great deal less. Karl Marx performed a valuable service to political economy by pointing out these facts and giving them the stress they deserve, in the teeth of savage opposition from the cheerleaders of the status quo who, then as now, dominated economic thought. His proposed solution to the pervasive problems of the (un)free market was another matter. Like most of his generation of European intellectuals, Marx was dazzled by the swamp-gas luminescence of Hegelian philosophy, and followed Hegel’s verbose and vaporous trail into a morass of circular reasoning and false prophecy from which few of his remaining followers have yet managed to extract themselves. I’ll leave such claims and the theories founded on them to the true believers, alongside such equally plausible claims as the Singularity, the Rapture, and the lemonade oceans of Charles Fourier; what history itself shows is something rather different. What history shows, as already noted, is that the complex systems that emerge during the heyday of a civilization are inevitably scrapped on the way back down. Market economies are among those complex systems. Not all civilizations have market economies—some develop other ways to handle the complicated process of allocating goods and services in a society with many different social classes and occupational specialties—but those that do set up market economies inevitably load them with as many intermediaries as the overall complexity of their economies can support. It’s when decline sets in and maintaining the existing level of complexity becomes a problem that the trouble begins. Under some conditions, intermediation can benefit the productive economy, but in a complex economy, more and more of the intermediation over time amounts to finding ways to game the system, profiting off economic activity without actually providing any benefit to anyone else. A complex society at or after its zenith thus typically ends up with a huge burden of unproductive economic activity supported by an increasingly fragile foundation of productive activity. All the intermediaries, the parasitic as well as the productive, expect to be maintained in the style to which they’re accustomed, and since they typically have more wealth and influence than the producers and consumers who support them, they can usually stop moves to block their access to the feed trough. Economic contraction, however, makes it hard to support business as usual on the shrinking supply of real wealth. The intermediaries thus end up competing with the actual producers and consumers of goods and services, and since the intermediaries typically have the support of governments and institutional forms, more often than not it’s the intermediaries who win that competition. It’s not at all hard to see that process at work; all it takes is a stroll down the main street of the old red brick mill town where I live, or any of thousands of other towns and cities in today’s America. Here in Cumberland, there are empty storefronts all through downtown, and empty buildings well suited to any other kind of economic activity you care to name there and elsewhere in town. There are plenty of people who want to work, wage and benefit expectations are modest, and there are plenty of goods and services that people would buy if they had the chance. Yet the storefronts stay empty, the workers stay unemployed, the goods and services remain unavailable. Why? The reason is intermediation. Start a business in this town, or anywhere else in America, and the intermediaries all come running to line up in front of you with their hands out. Local, state, and federal bureaucrats all want their cut; so do the bankers, the landlords, the construction firms, and so on down the long list of businesses that feed on other businesses, and can’t be dispensed with because this or that law or regulation requires them to be paid their share. The resulting burden is far too large for most businesses to meet. Thus businesses don’t get started, and those that do start up generally go under in short order. It’s the same problem faced by every parasite that becomes too successful: it kills the host on which its own survival depends. That’s the usual outcome when a heavily intermediated market economy slams face first into the hard realities of decline. Theoretically, it would be possible to respond to the resulting crisis by forcing disintermediation, and thus salvaging the market economy. Practically, that’s usually not an option, because the disintermediation requires dragging a great many influential economic and political sectors away from their accustomed feeding trough. Far more often than not, declining societies with heavily intermediated market economies respond to the crisis just described by trying to force the buyers and sellers of goods and services to participate in the market even at the cost of their own economic survival, so that some semblance of business as usual can proceed. That’s why the late Roman Empire, for example, passed laws requiring that each male Roman citizen take up the same profession as his father, whether he could survive that way or not. That’s also why, as noted last week, so many American jurisdictions are cracking down on people who try to buy and sell food, medical care, and the like outside the corporate economy. In the Roman case, the attempt to keep the market economy fully intermediated ended up killing the market economy altogether, and in most of the post-Roman world—interestingly, this was as true across much of the Byzantine empire as it was in the barbarian west—the complex money-mediated market economy of the old Roman world went away, and centuries passed before anything of the kind reappeared. What replaced it is what always replaces the complex economic systems of fallen civilizations: a system that systematically chucks the intermediaries out of economic activity and replaces them with personal commitments set up to block any attempt to game the system: that is to say, feudalism. There’s enough confusion around that last word these days that a concrete example is probably needed here. I’ll borrow a minor character from a favorite book of my childhood, therefore, and introduce you to Higg son of Snell. His name could just as well be Michio, Chung-Wan, Devadatta, Hafiz, Diocles, Bel-Nasir-Apal, or Mentu-hetep, because the feudalisms that evolve in the wake of societal collapse are remarkably similar around the world and throughout time, but we’ll stick with Higg for now. On the off chance that the name hasn’t clued you in, Higg is a peasant—a free peasant, he’ll tell you with some pride, and not a mere serf; his father died a little while back of what people call “elf-stroke” in his time and we’ve shortened to “stroke” in ours, and he’s come in the best of his two woolen tunics to the court of the local baron to take part in the ceremony at the heart of the feudal system. What this means in practice is anything but vague. As the baron’s man, Higg has the lifelong right to dwell in his father’s house and make use of the garden and pigpen; to farm a certain specified portion of the village farmland; to pasture one milch cow and its calf, one ox, and twelve sheep on the village commons; to gather, on fourteen specified saint’s days, as much wood as he can carry on his back in a single trip from the forest north of the village, but only limbwood and fallen wood; to catch two dozen adult rabbits from the warren on the near side of the stream, being strictly forbidden to catch any from the warren on the far side of the millpond. And, as a reward for a service his great-grandfather once performed for the baron’s great-grandfather during a boar hunt, to take anything that washes up on the weir across the stream between the first sound of the matin bell and the last of the vespers bell on the day of St. Ethelfrith each year. In exchange for these benefits, Higg is bound to an equally specific set of duties. He will labor in the baron’s fields, as well as his own and his neighbors, at seedtime and harvest; his son will help tend the baron’s cattle and sheep along with the rest of the village herd; he will give a tenth of his crop at harvest each year for the support of the village church; he will provide the baron with unpaid labor in the fields or on the great stone keep rising next to the old manorial hall for three weeks each year. If the baron goes to war, whether he’s staging a raid on the next barony over or answering the summons of that half-mythical being, the king, in the distant town of London, Higg will put on a leather jerkin and an old iron helmet, take a stout knife and the billhook he normally uses to harvest wood on those fourteen saint’s days, and follow the baron in the field for up to forty days. None of these benefits and duties are negotiable; all Higg’s paternal ancestors have held their land on these terms since time out of mind; each of his neighbors holds some equivalent set of feudal rights from the baron for some similar set of duties. Higg has heard of markets. One is held annually every St. Audrey’s day at the king’s town of Norbury, twenty-seven miles away, but he’s never been there and may well never travel that far from home in his life. He also knows about money, and has even seen a silver penny once, but he will live out his entire life without ever buying or selling something for money, or engaging in any economic transaction governed by the law of supply and demand. Not until centuries later, when the feudal economy begins to break down and intermediaries once again begin to insert themselves between producer and consumer, will that change—and that’s precisely the point, because feudal economics is what emerges in a society that has learned about the dangers of intermediation the hard way and sets out to build an economy where that doesn’t happen. There are good reasons, in other words, why medieval European economic theory focused on the concept of the just price, which is not set by supply and demand, and why medieval European economic practice included a galaxy of carefully designed measures meant to prevent supply and demand from influencing prices, wages, or anything else. There are equally good reasons why lending money at interest was considered a sufficiently heinous sin in the Middle Ages that Dante, in The Inferno, put lenders at the bottom of the seventh circle of hell, below mass murderers, heretics, and fallen angels. The only sinners who go further down than lenders were the practitioners of fraud, in the eighth circle, and traitors, in the ninth: here again, this was a straightforward literary reflection of everyday reality in a society that depended on the sanctity of verbal contracts and the mutual personal obligations that structure feudal relationships. (It’s probably necessary at this point to note that yes, I’m quite aware that European feudalism had its downsides—that it was rigidly caste-bound, brutally violent, and generally unjust. So is the system under which you live, dear reader, and it’s worth noting that the average medieval peasant worked fewer hours and had more days off than you do. A fully developed feudal system takes several centuries to emerge. The first stirrings of one, however, begin to take shape as soon as people in a declining civilization start to realize that the economic system under which they live is stacked against them, and benefits, at their expense, whatever class of parasitic intermediaries their society happens to have spawned. That’s when people begin looking for ways to meet their own economic needs outside the existing system, and certain things reliably follow. The replacement of temporary economic transactions with enduring personal relationships is one of these; so is the primacy of farmland and other productive property to the economic system—this is why land and the like are still referred to legally as “real property,” as though all other forms of property are somehow unreal; in a feudal economy, that’s more or less the case. A third consequence of the shift of economic activity away from the institutions and forms of a failing civilization has already been mentioned: the abandonment of money as an abstract intermediary in economic activity. That’s a crucial element of the process, and it has even more crucial implications, but those are sweeping enough that the end of money will require a post of its own. We’ll discuss that next week.